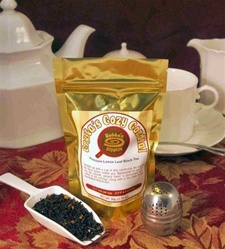 Snuggle up with a cup of this comforting tea and let the warm spices coddle you. Appreciated on any cool day, the smooth, gingery flavor is particularly well-suited to the holidays along with a few bites of our homebaked Walnut Roll. Granddaughter came to visit and we used the tea sample that arrived in the morning. We sat at the table and talked and the tea was really nice. All of us enjoyed it.